It was with great joy that the Church of Georgia on December 20 2012 confirmed Archimandrite Gabriel (Urgebadze) amongst the Saints of Christ’s Church. 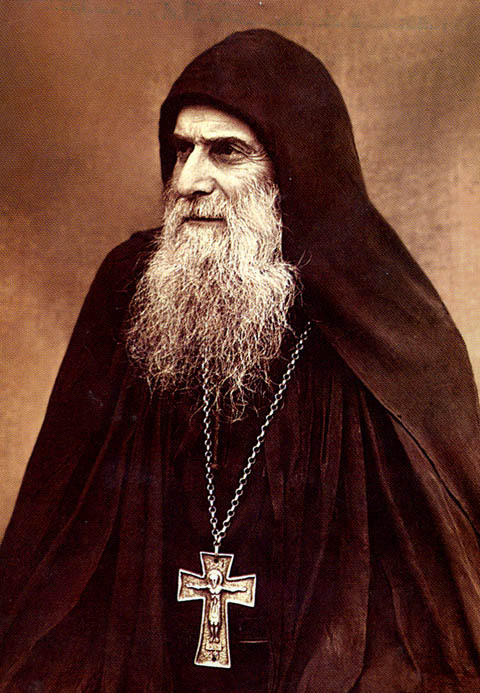 Any new arrival in Georgia will be surprised to see photographs of an elderly monk of small stature in offices, taxis and homes. “Mama Gabrieli” was well-loved during his difficult life in the Soviet era and revered after his death, with many miracles attributed to him. Saint Gabriel was a deeply eccentric character and to the Soviet authorities he was considered to be insane. He was renowned during his life as a “Fool-for-Christ“; in Greek the term is “Salos”. This is a humble person of great holiness who is considered highly unconventional by secular society. Saint Gabriel was famed for his powers of prophecy during his life, as well as a fearless approach to denouncing Communism publicly; had he been considered “sane” by the authorities, he probably would have been executed. He was famous for tearing down a giant banner of Lenin during a May Day parade and trampling upon it while denouncing the Marxists, for which he was beaten badly. He was renowned for his compassion and deep insight into human nature. Saint Gabriel spent much of his later life living at the Monastery of Saint Nino, a nunnery attached to the Samtavro Church of the Transfiguration in Mtskheta. It is just uphill from the Svetiskhoveli Cathedral. He died in 1995 and is buried there; there are many pilgrims who visit his grave every day. A detailed website providing information about his life can be viewed here. Video footage of his Canonisation is provided here .